This is a very amusing trick, the success of which depends solely upon the audacity of the conjurer. He puts an ordinary pocket handkerchief upon the table, with a sixpence in the centre of it. The handkerchief is slowly rolled up with the coin in the middle. cloth on the table is thick enough not to let the sixpence make a noise when dropped upon it. to commence unrolling as soon as point B comes in sight, and before point A appears. 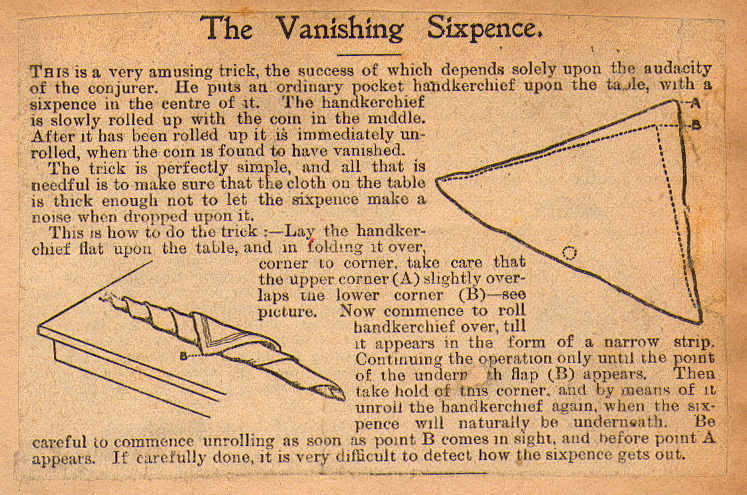 If carefully done, it is very difficult to detect how the sixpence gets out.